Content View: Table Border behaviour? 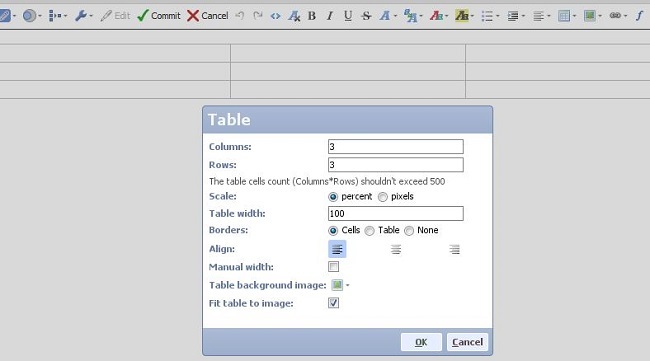 I tried to insert a 3x3 table into a content view but I am not seeing the outline of the table. Any assistance will be appreciated. I have attached a picture of what I am seeing. I've encountered this bug before, all you have to do is enter a empty line by pressing "Return" then you can insert the table on the second line and it will appear. Which build of Omniscope are you using? I could not reproduce this, but you can try to use other options to define border behaviour. Please click inside the table and then use the options, as per screenshot below. There was a bug when you tried to insert a table at the beginning of the Content view. Try the work around that was suggested by Daniel (to enter some content before inserting a table) or update to the latest build. Thanks for your response. The workaround isn't working. I have installed the latest version of Omniscope 2.8 (build 1216) and I am still getting the same thing. Could you attach the file here in which you tried to insert the table (e.g. just in a new file)? I have attached the file. I sent the file to a colleague and it seems to work fine on their computer. I can see the border of the table on my computer. As you described the issue can be with the table border colour and your computer colour settings/theme. What happens when you try to open this file again on your computer after you opened on another one and it worked? You can try to change the table border. When in Edit mode, put cursor into the table and pick another colour in "Table->Edit table colours->Border colour". Save the file and try to open on your computer again.